____ WhereIsHolden? : Safe in New Zealand! So I made it to Auckland last night, stayed with the Karl family, and am now on my way to Christchurch after a day of tooling around Auckland (up on Mt. 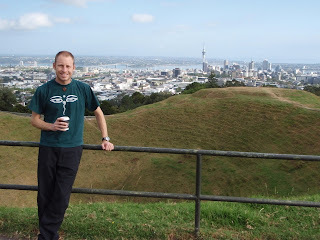 Eden, a big volcano crater behind me, Auckland city in the back). After Christchurch, it's southward, to Dunedin and possibly Invercargill. I'll most likely unplug a bit more in the coming days (thanks Jos) . Glad you made it dude. Seems like it was a close one - sure would have been funny if you arrived back at LAX instead, ha! Drink a pint for me to celebrate!